Pedalling Squares: Vuelta 2012: Very Northern, Very Steep. That's not a misprint, they really are ignoring half of the country. I’m really starting to love the Vuelta. I know, as a cycling fan I’m supposed to make snide comments about the route taking in Spain’s finest dual carriageways and concrete factories, or point out that all the top drawer riders will go home after using the first week as training for the Worlds, but I just don’t feel like doing that. I’ve really enjoyed the last two Vueltas. Obviously 2011 stands out for the high placings of Bradley Wiggins and Chris Froome, the ascent of la Gamonal that ended Wiggo’s hopes and prompted a thousand speculative “what’s in Cobo’s fridge?” posts on internet forums, and the throat shredding showdown on Pena Cabarga (I don’t know if it shredded Froome and Cobo’s throats really, but I screamed myself hoarse). Even 2010’s race stands out for me. People talk about the 2010 Giro being one of the finest stage races in decades, but let’s be honest, it wouldn’t have been half as interesting if it weren’t for Vinokourov’s race losing refusal to chase on the road to l’Aquila. That year’s Vuelta, on the other hand, owed its excitement not to huge gaps opened by passivity, but to the constantly shifting battle to close the narrow gaps between Nibali, Anton and Mosquera. It might not have had the muddy strade bianchi or Basso’s redemptive win on the Zoncolan, but for me the Vuelta was the best grand tour of 2010 and were it not for an exceptional Tour De France, it would have been the best grand tour of 2011 too. Which brings us to this years Vuelta, the route of which was announced this morning. It revisits two of the key battlefields of 2010: Lagos De Covadonga, the Vuelta’s Alpe D’Huez, and Bola Del Mundo, the ever steepening ramp that saw Nibali seal his victory with a desperate pursuit of Ezequiel Mosquera through the mist on the penultimate day. 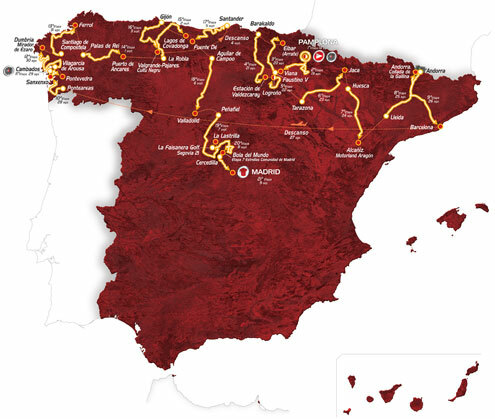 While the Giro and the Tour are both opting for slightly less mountainous routes in 2012, the Vuelta is going the other way. Officially there are seven mountaintop finishes, but a closer look reveals that some of the non-mountain stages in fact feature short, vicious climbs to the finish, such as the 15% max Rapitan and the 28% max Mirador de Ezaro. I know I promised stop scoring easy wins with predictions of Joaquim Rodriguez victories, but anything short and damn near vertical has the Katusha man's name written all over it. Usually literally. Of course, there’s a 16K Team Time Trial in Pamplona that won’t suit him, and a 40K individual test on Stage 11 that could be disastrous: he blew four minutes in 2011 and six in 2010 over similar distances. Nevertheless, the better time triallists may well be discouraged by the amount of climbing to be done, so perhaps the margins against the clock will be reduced by conservatism or absence. Although the mountains are the best bit of any race, packing a grand tour with climbs doesn’t always make it interesting. Contador’s unchallenged victory in last year’s Giro proves that. Nevertheless, the mix of big climbs on short stages and vicious ramps ending otherwise pan flat pootles through the Spanish countryside looks like a recipe for explosive racing. I can’t wait.